Despite my occasional lack of tact, horrible habit of interrupting, and utter failure to control the volume of my voice, I do truly have the best of intentions. Case-in-point: this carrot smoothie. Or, more appropriately, this carrot cake smoothie. I fully intended to make a wholesome, veggie-ful carrot smoothie. I blended together a saintly quantity of chopped carrots, a touch of pineapple for sweetness, Greek yogurt for protein, and Silk Vanilla Cashew Milk for creaminess. 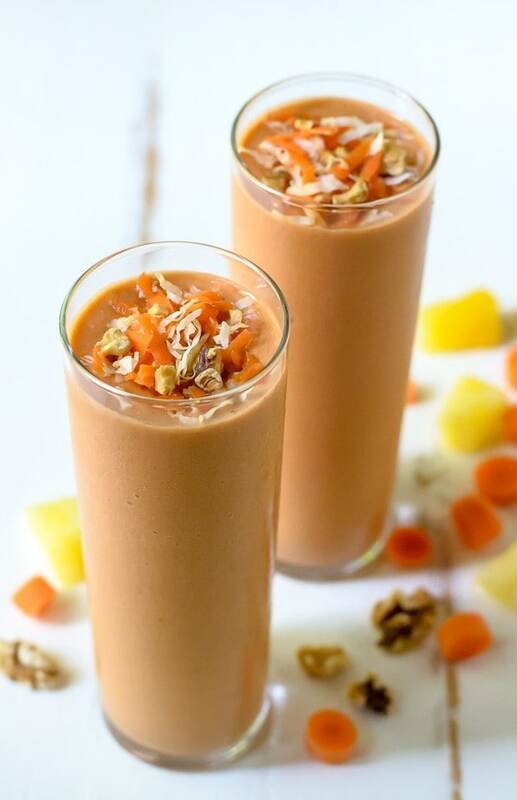 The perfect carrot smoothie. Really, I should receive an award for the amount of veggies I was about to consume before 9 a.m.
Then, just as I was about to pour my lovely orange beverage into a tall glass, I couldn’t help but think how nicely the tropical pineapple would pair with a handful of island-minded coconut and that banana slices (another friend of the islands) would make the carrot pineapple smoothie even thicker and sweeter. Done. Of course, I do love a bit of nut butter in my smoothies to make them extra rich and filling, and it so happened that I had a few extra toasted walnuts in my cupboard. Perfect! Into the blender the walnuts went. And really, what are walnuts without cinnamon and nutmeg? Obviously, I needed a little spice. I was thisclose to topping the carrot smoothies with raisins when it hit me: I had turned my carrot smoothie into my favorite recipe for Healthy Carrot Cake. Oops. My subconscious clearly needed a slice of carrot cake that morning (just as it needed a slice of pie the three consecutive days I made this Blueberry Pie Smoothie), because this carrot smoothie has all of its key ingredients: sweet carrot and pineapple; tropical coconut; and toasty walnuts (I ended up omitting the raisins which are carrot-cake controversial anyway, but if you want to sprinkle a few on top, I support you). 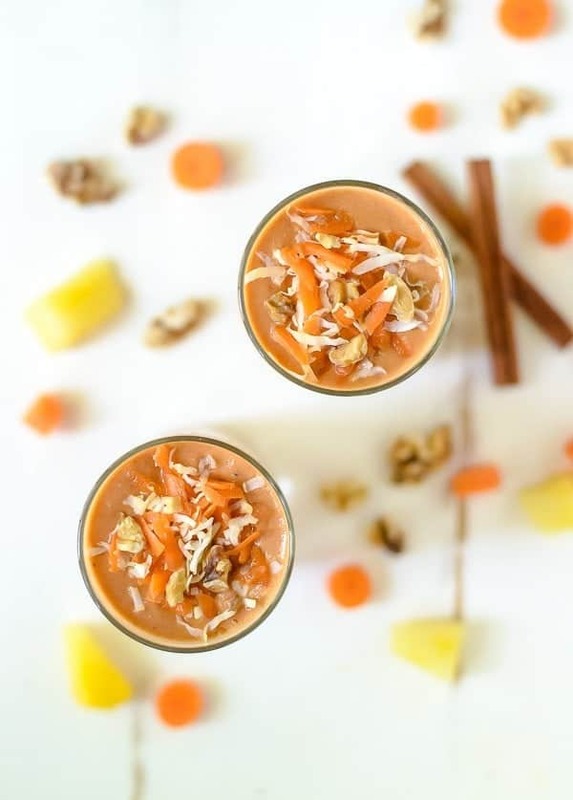 Like a slice of carrot cake, this carrot smoothie is fresh, sweet but not too sweet, and boast layers of complementary flavors. Unlike a slice of carrot cake, however, it is a squeaky-clean healthy choice for breakfast, and you can easily sip one on the run. With the back-to-school wave washing over the country, recipes like this carrot smoothie (and this Beet Smoothie!) are an easy breezy way to ensure that kids start their mornings powered for a day of learning. You can also prep the carrot smoothie entirely the night before. Simply place all of the ingredients except for the frozen fruit into your blender pitcher, then pop the pitcher into the fridge. In the morning, add the banana and pineapple, blend, and you have a wholesome breakfast ready to serve in fewer than three minutes. That’s faster than I can toast a frozen waffle or pastry, and a much healthier option too! Even with their dessert leanings, the wholesome ingredients in these carrot smoothies have made good on my healthy breakfast intentions. My next project: learn to control the volume of my voice in public, 25% of the time. I think I need another carrot smoothie for stamina. 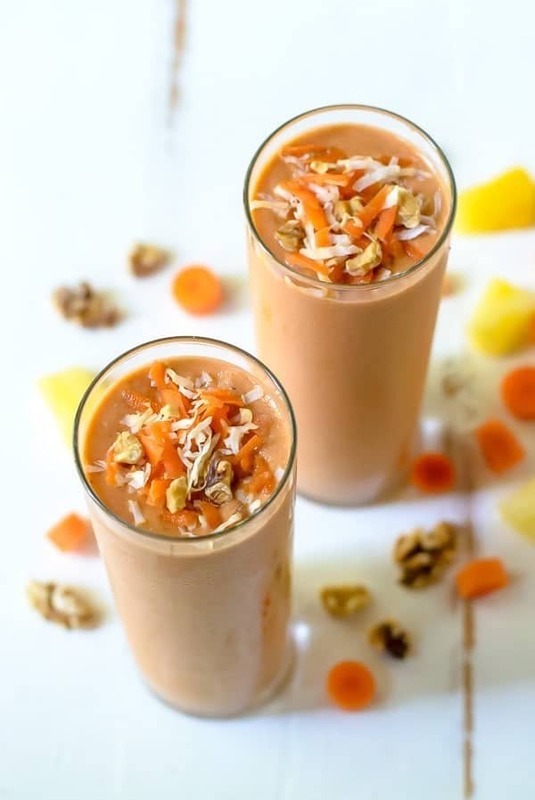 A healthy carrot smoothie that tastes just like carrot cake! Made with pineapple, banana, and yummy carrot cake spices. 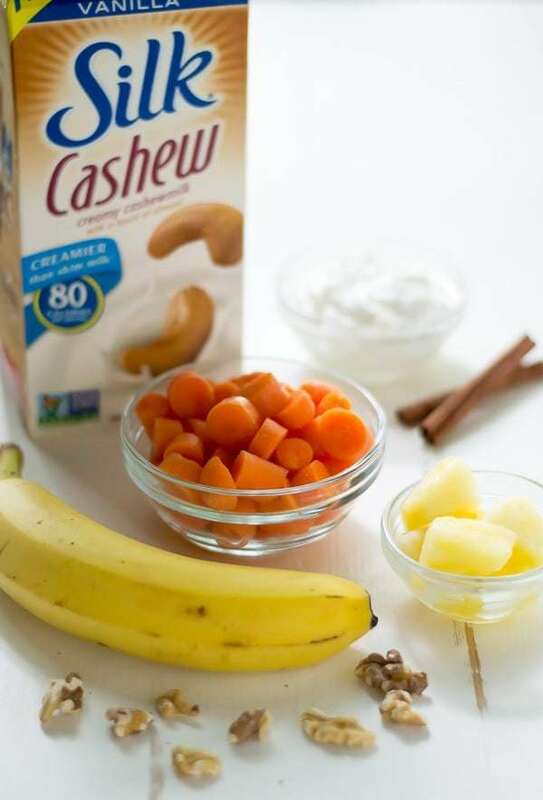 Add all of the ingredients to your blender: carrots, banana, Greek yogurt, cashew milk, pineapple, walnuts, coconut (if using), cinnamon, and nutmeg. Blend until smooth. Enjoy immediately, topped with additional shredded carrots, coconut, and/or crushed walnuts as desired. I’m sharing this post in partnership with Silk. As always, all opinions are my own, and thank you for supporting the brands and companies that make it possible for me to continue bringing quality content to you. This is a great smoothie idea. So original! And a great break from the usual berry banana whatever. Love it! Carrot cake is a family fave! We even had it as our wedding cake years ago. Even my kids request my homemade healthy version for their birthdays! I’m definitely going to try this recipe! I can almost taste it from reading the recipe. I’ll definitely have to try this one, since smoothies are one of my two favorite breakfasts. Carrot cake is tooootally health food :) Love this! 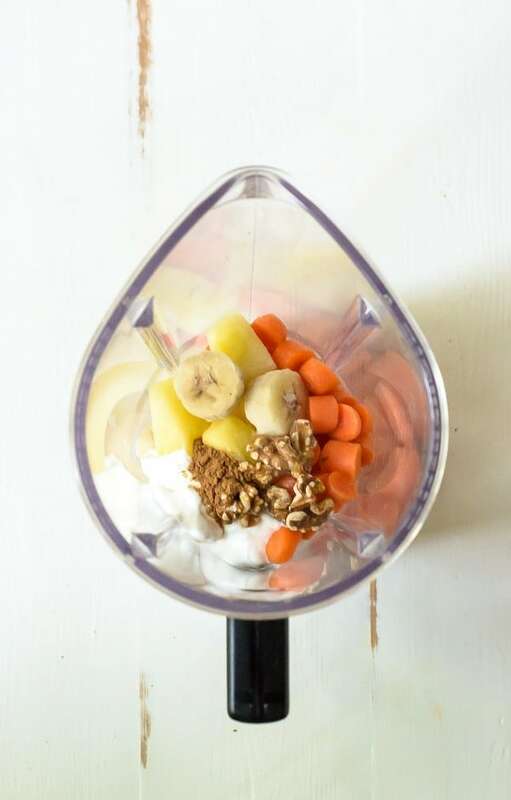 Love this smoothie concoction! I’ve never tried adding carrots to a smoothie before! Sounds great (except the Silk, we don’t drink it because some ingredients in it are not healthy). We LOVE carrot cake in this family. Hi Dee! You can use any type of milk you like and this will still taste great. Hope you enjoy! Erin! This smoothie…wow! It was out of this world. It seriously did taste like carrot cake. Thank you so much for sharing this recipe. Valerie, I’m so happy hear that you loved it! Isn’t it fun having dessert in smoothie form? :-) Thanks so much for taking time to leave your review! Megan, thanks so much for taking the time to report back! I’m so glad to hear you enjoyed the smoothie. I was highly skeptical as were my kids, but we all ended up loving it. Thanks for a great way to get an extra serving of veggies! Maria, I am so so happy to hear this. Thank you! I hope you enjoy, Morgan! Going to try but wanted to make sure if it would be too runny or foamy without the ice. Hi Daniel! No, I did not use ice. I hope you enjoy!